Should you test your emergency notification system? The simple answer is, yes. You should be testing your emergency notification system. Not only does this help to ensure the success of your emergency action and response plan, but it is also a great opportunity to review your plan with everyone in your organization. You're not only testing your ENS, but you're also testing the infrastructure of your organization. 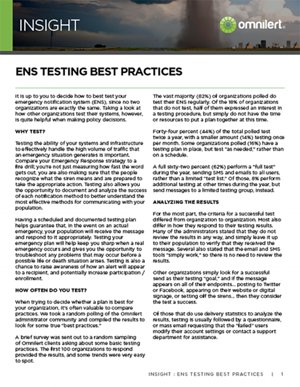 Read this Insight to learn how, when, and what to do to test your ENS.